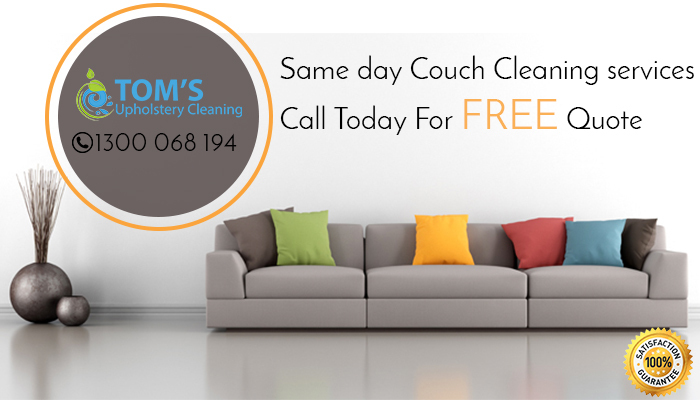 Toms Upholstery Cleaning offers professional Sofa Cleaning, Lounge Cleaning and Couch Cleaning services. Call on 1300 068 194 for Same Day Upholstery Cleaning service. We understand your upholstered furniture needs good care, so we provide Upholstery Cleaning Service in Melbourne, Sydney and Brisbane. Our high quality Upholstery Cleaning service ensure: Appropriate Cleaning is undertaken according to the nature of your fabric and We detect spot or stain on your upholstered furniture and clean them from their roots using our best technology. Our Cleaning process includes: Sanitizes upholstery to eliminate unhealthy bacteria that can spread illness,reduces common allergens from dust mites, pests, pet dander, pollen and more and we also provide fabric deodorising and protection including upholstery cleaning service. We can also apply a special protective coating like scotchguard to enhance the appearance of your upholstery and protect the fabric from wear, tear and spills. Just like you need your doctor advice to remain healthy, your upholstered furniture needs Toms Upholstery Cleaning Service to make it safe and clean for you. Most of dust particles and allergens are not visible but they are present so you need professional cleaning of your furniture. Advice and recommendation is also given by our cleaners so that you can maintain your furniture upholstery. We make you sure that you are 100% satisfied with our best upholstery cleaning Australia services. Your expensive furnishings are not damaged at time of cleaning. Our aim is to provide you with the best upholstery cleaning service in the Australia, which is why we offer residential upholstery cleaning service to our clients. Keeping your home clean is about more than just vacuuming your furniture, it is also about maintaining and cleaning all of the upholstery in your home. Dust and contaminants can get into any upholstery, That’s why it is important to have all of your upholstered furniture regularly cleaned and maintained by a professional. We carefully inspect the construction of the upholstery and pay special attention to any areas of concern to assure the proper cleaning techniques are employed. The result is a more thorough and detailed cleaning for your delicate upholstery. We clean your upholstery with the latest, advanced, fabric-safe products and use heavy-duty extraction equipment to remove stains and soil from your furniture. Then we can treat your furniture with special products to help it resist future staining. We guarantee your satisfaction, or we’ll make it right at affordable price. Don’t replace upholstery when it becomes dingy and stained! Toms commercial upholstery cleaners has nearly 10 years of experience performing residential and commercial upholstery cleaning. The type of stain or the style of fabric doesn’t matter. Our expert upholstery cleaning technicians know how to handle every fabric and every possible issue. The upholstered furniture at your office takes a beating. This is especially true when it’s being used and abused by multiple employees and all your potential clients and customers. Dust, pollen, food crumbs, and stains seep deep into the upholstery, to remove these contaminants and preserve the quality of your investment, you need the help of professional upholstery cleaning service, Call us today on 1300 068 194 for high quality commercial upholstery cleaning service. Hot water extraction or Upholstery Steam Cleaning Australia is a very popular and effective method for deep cleaning and sanitising. It is eco friendly and the safest non-toxic human and pet-friendly method for upholstery cleaning. Due to our powerful equipment, we are able to deliver the results you desire within a fraction of the time and with much shorter drying time. The quality of the results achieved with Toms professional steam cleaning Australia is much higher than the results achieved with a regular steam cleaning. It is suitable for all fabrics in residential properties, as well as business and industrial premises. Upholstery Dry Cleaning Australia : Delicate fabric is cleaned with dry powder which is applied carefully, as a non-professional can easily damage the surface of the upholstery. Our experienced teams are specially trained and consider all these factors in their approach when choosing a method for cleaning your fabric upholstery. No. 1 upholstery cleaning company Australia is near to you, contact us on 1300 068 194. Child care, schools, supermarkets, nursing homes, kinder gardens couch cleaning. It is not recommended to wait for long to do couch cleaning in such a situation as the longer you will delay, the more the stain and odor will refuse to go. The easiest solution to solve this persisting problem is hiring Toms Upholstery Cleaners Australia. You can avail our cleaning services that guarantee removal of pet odor completely from your sofa as well as couch upholstery. Give us a call now on 1300 068 194 for Same day couch cleaning Australia services and you can enjoy our professional upholstery cleaning service. Affordable upholstery cleaning Australia with amazing result.